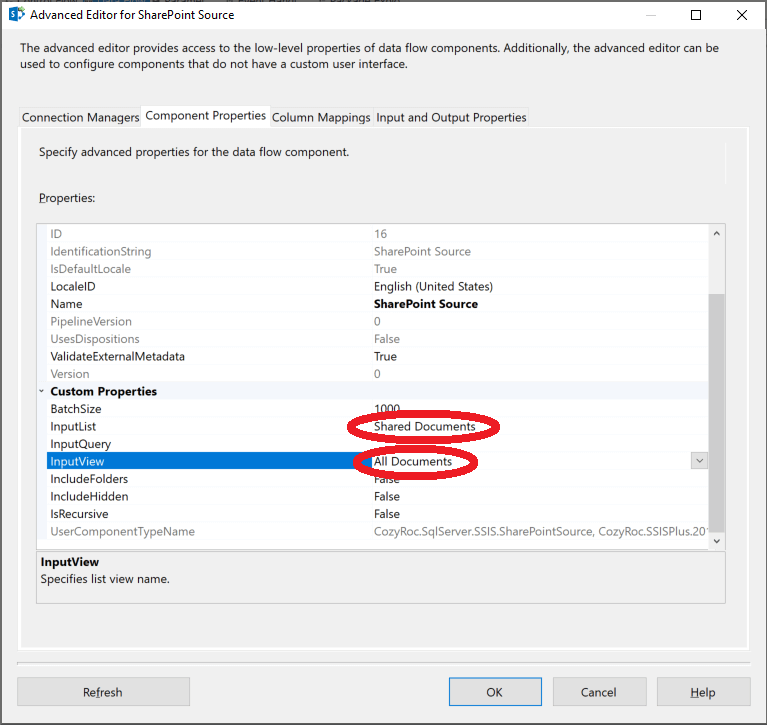 SharePoint Source Component is an SSIS Data Flow Component for consuming data from the SharePoint Service. The configuration parameters are provided in the standard data flow source component dialog. In this section we will show you how to set up a SharePoint Source component. 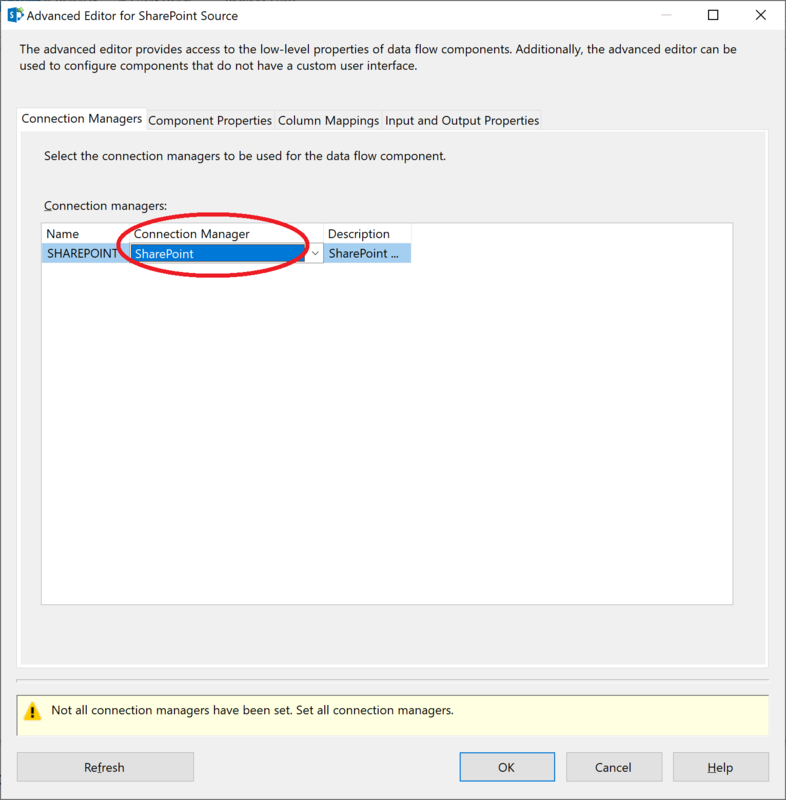 Before you begin, configure a SharePoint connection manager. In the SSIS Toolbox, locate the SharePoint Source component and drag it onto the Data Flow canvas. Once the component editor opens, in the Connection Managers tab, select the connection manager you configured earlier from the Connection drop-down list. Click on the Component Properties tab. Make a selection from the InputList drop-down list. In this example, we have selected “Shared Documents”. Next, make a selection from the InputView drop-down list. In this example, we have selected “All Documents”. Congratulations! You have successfully configured the SharePoint Source component. Select an existing SharePoint connection manager. Specify the number of rows to be retrieved as a batch. The maximum is 5000. Specify a CAML query statement. This parameter is optional. Select the SharePoint list view to use for input. This parameter is optional. Indicate that the folders should be included in the result list. The default is false. Indicate that sub-folder items should be included in the result list. The default is false. Indicate that hidden list fields should be included. The default is false. Where can I find the documentation for the SharePoint Source? Fixed: Multiple fixes in CAML statement design dialog (Thank you, Luigi). Fixed: Component did not work in dynamic data flow (Thank you, Masthan). New: Component now shows user-friendly names for columns containing spaces (Thank you, Michael). New: Component now includes column with list item's attachments (Thank you, Anthony). New: A new parameter IncludeHidden to include list's hidden fields.